NRECA is working with a bipartisan group of lawmakers in Congress to pass legislation that would give electric cooperatives access to more money to modernize their plants and reduce costs for consumer-members. 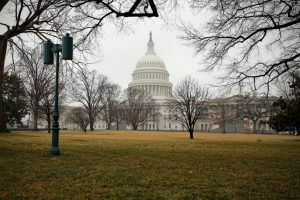 A view of the United States Capitol building on a cold rainy day in winter. “Rural electric cooperatives reach underserved areas far and wide providing dependable electricity … to power their homes, farms and businesses,” said Sen. Jerry Moran, R-Kan., who introduced the bill on Feb. 28 with Sen. Jon Tester, D-Mont. The Improving Rural Access to Power Act would allow the Federal Home Loan Bank to voluntarily buy securities issued by a qualified cooperative lending association. The associations help secure loans for individual co-ops to use to modernize and expand local power grids. Additional capital from the federal bank would help co-ops do more to upgrade their systems, the senators said. “Whether it’s running a business, charging a computer or simply keeping the lights on, [co-op members] need access to reliable, affordable power, no matter where they live,” Tester said. Both Tester and Moran serve on the Senate Banking, Housing and Urban Affairs Committee, which must approve the legislation before it can go to the full Senate. The bill’s supporters have been trying to pass a similar measure since 2016, but their efforts stalled in the House. NRECA is working with the National Rural Utilities Cooperative Finance Corporation (CFC) to advance the legislation in the 116th Congress. “This sensible, bipartisan bill will help further enhance the system of finance that supports the important work that co-ops do in rural America,” said John Cassady, NRECA’s vice president of legislative affairs.